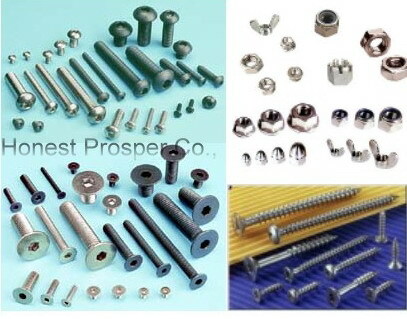 Type: Hex Bolts, Round Head Square Neck Carriage Bolts, Hex Socket Cap Screws, Hex Socket Set Screws, Botton Head Bolt Screws, Tapping Screws, Wood Screws, Lifting Eye Bolts, Eye Bolt Form B, Masonary Bolts, U-Bolts. Parts upon Customer\'s request and their drawing or sample. Type: Hexagon Nuts, Nyloc Nuts, all metal insert locking Nuts, Domed Cap Nuts, Acorn Cap Nuts, Flange Nuts, Square Nuts, Weld Nuts, Round Nuts, Lifting Eye Nuts, Slotted and Castle Nuts, Chain roller, Other special Nuts or machine Parts upon Customer\'s request and their drawing or sample. Type: Parts upon Customer\'s request and drawing or sample; DIN931, DIN933, DIN603, DIN912, DIN913, DIN916, DIN84, DIN85, DIN7985, DIN965, DIN966, DIN7981, DIN7982, DIN571, DIN580, DIN444, DIN529, DIN3570, DIN975, DIN976.